At the second Vietnam Private Sector Forum (VPSF), according to experts, promoting tourism was identified as one of the three "bottlenecks" of Vietnam's tourism sector that affirms that focusing on improving the effectiveness of tourism promotion is the urgent and long-term solution for tourism development. According to the General Statistics Office (GSO), Vietnam’s tourism industries welcomed over 10 million international visitors in 2016, rising by 26 percent from 2015 and doubling the figure of 2010, earning approximately VND417 trillion (US$18.3 million) in total revenue. In the first seven months of 2017, the number of foreign tourist to Vietnam reached 7.25 million, up 28.8% annually. This encouraging growth rate is due to the important contribution of tourism promotion activities. Over recent years, the scale, scope and quality of tourism promotion activities has been expanded. 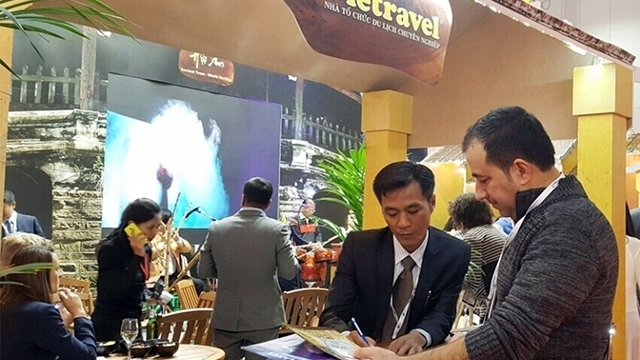 Every year, the Vietnam National Administration of Tourism (VNAT), under the Ministry of Culture, Sports and Tourism, participates in around 14 major international fairs, such as Travex, ITB in Germany, MITT (Russia) and Jata (Japan); meanwhile the VNAT also organizes ten to 15 farm and press trips to introduce the destinations and outstanding tourism services of Vietnam; alongside nearly 15 roadshows in the main foreign markets. In addition, tourism promotion through the media and e-marketing has also been promoted. The promotion activities through annual international events, such as the Da Nang Fireworks Festival, Dalat Flower Festival, Thai Nguyen Tea Festival and the National Tourism Year event, have brought about many positive outcomes. As a result, several of Vietnam's tourist destinations have become famous and have created a brand with foreign travelers, such as Ha Long, Sa Pa, Hanoi, Da Nang, Hoi An, Nha Trang, Phu Quoc and Mui Ne. However, marketing effects from promotion activities are still not commensurate with the tourism potential. Promotion activities through events have not achieved the expected results on investment or connecting business. It's clear to see that Vietnam’s tourism promotion activities as a whole are quite monotonous, whilst lacking of creativity and professionalism. However, according to experts, it is difficult to make any breakthroughs if the budget expenditure for tourism promotion is as tight as it is today. According to Forbes magazine, Thailand's national tourism promotion budget is US$ 69 million per year, Malaysia’s (US$ 105 million per year), Indonesia’s (US$ 200 million per year); while Vietnam’s is only US$2 million per year which is too low compared to the other ASEAN countries and others within the region. According to Vu The Binh, Standing Vice Chairman of the Vietnam Tourism Association, within the confines of the budget, the Vietnam tourism industry can not do enough. The limited budget has limited the use and exploitation of the popular and effective tourism promotion activities in the world, such as creating impressive forms for the national pavilions at international fairs, and advertising the national tourism sector in foreign media. According to Director of Hanoitourist Travel Company Luu Duc Ke, Vietnam does not have an office abroad, which is the most knowledgeable force in the market, to promote on-the-spot tourism, meanwhile Thailand has 27 representative offices; Singapore has 23 offices; and Malaysia has 35 offices abroad. Therefore, over recent years, information on Vietnam’s tourism for overseas visitors has not been adequate; promotion activities in many countries lack specific information about specific products in order to serve tourists in each key market. The Politburo’s Resolution No. 08-NQ/TW on developing the tourism industry into a spearhead economic sector, set a target of welcoming 17-20 million foreign arrivals and 82 million domestic tourists by 2020, whilst earning a total revenue of US$35 billion, contributing 10% to the country’s GDP, and creating 4million jobs, including 1.6 million direct jobs. Accordingly, in order to meet the goal, the tourism industry must achieve a growth rate of 15 to 20% each year, requiring the industry to make great efforts, especially in tourism promotion, to create breakthroughs in attracting visitors. According to experts, in order to create breakthroughs in tourism promotion, the budget expenditure for tourism promotion should be raised to a sufficiently large and stable level. Aiming to meet the demand, the establishment of a tourism development assistance fund is considered as an expected solution. The fund is expected to be established in late 2017, or early 2018, according to VNAT General Director Nguyen Van Tuan and it will have a total capital of approximately VND400 billion (US$17.6 million) to VND500 billion (US$22 million), he added. Initially, the money will be provided by the State, but it will then be supplemented by entrance fees and visa fees in the subsequent years. However, Hoang Nhan Chinh, head of secretary of the Tourism Advisory Board, said that travel enterprises should also commit to donating to the fund. Recently, the Tourism Advisory Board (TAB) has established a Tourism Investment Club, which has attracted around ten businesses, including large companies such as Vietnam Airlines, Vingroup and Thien Minh Group and HG Group. The club can provide roughly VND25 billion (US$1 million) to support tourism promotion. From now until 2020, the club’s enterprises are expected to contribute VND70 billion (US$3 million)to the tourism development assistance fund, according to TAB’s pledge, while they will actively participate in the promotion activities at important international tourism fairs. However, in order to maintain the fund, the issues which businesses are most concerned about are the rationality, transparency and publicity. Therefore, it is necessary to have a team with expertise and a fund management mechanism that is easy to mobilize and use effectively. Vietnam is in a strong integration process, and for this reason, cooperation with countries within the region and the world is an indispensable trend for economic development in general, and tourism in particular, including tourism promotion activities. Over the past while, inter-regional coordination activities, such as the connection of the eight Northwestern provinces and the connecting of the three central provinces (Thua Thien-Hue, Da Nang and Quang Nam), has achieved positive results in creating regional tourism brands. Vietnam has bilateral and multilateral commitments in tourism development cooperation, with many countries, especially the ASEAN countries. The relationship is both cooperative and competitive in that it requires Vietnam, on the one hand, to coordinate with the ASEAN countries to promote ASEAN as a common destination, and on the other hand, to have different policies in order to promote and attract visitors to Vietnam. In the context of tourism competition, several countries, such as Malaysia, Thailand and Singapore, have made certain adjustments in their tourism development strategy to increase the effectiveness of their promotion activities on the world. Vu The Binh, Standing Vice Chairman of the Vietnam Tourism Association said that in the immediate future, Vietnam should step up their promotional activities in the ASEAN region, because according to statistics, since the beginning of the year, Vietnam welcomed 1.3million visitors from Thailand, Singapore, Malaysia, Laos, Cambodia and Myanmar, but the number of Vietnamese people traveling to these countries reached more than three million. This is an imbalance and it is necessary to have a plan to attract tourists in the region. In addition, for other markets, the promotion plans should be implemented for six months to a year in order to be effective. In fact, electronic marketing in tourism has been paid great attention. Over the past few years, VNAT has advertised many activities and events at vietnamtourism.gov.vn and vietnamtourism.com, vietnamtourism.vn, as well as through Facebook, fanpage Vietnam Timeless-Charm and YouTube channels. The VNAT also organised a mega selfie programme and an online photo contest on Vietnam tourism and reality TV shows. The activities saw positive results, for example: after three years of deployment, the Youtube channel has attracted 340,000 views; fanpage Vietnam Timeless-Charm attracted more than over 19,000 followers regularly, website vietnamtourism.com attracted 2.3 million visitors, and vietnamtourism.gov.vn attracted about 1.35 millions of visitors per month. According to Deputy Director General of VNAT Ha Van Sieu, in the near future, the tourism industry will focus on applying e-marketing in promoting domestic and international tourism through the organisation of many events, activities on websites, social networks and applications for mobile phones. "Boosting tourism promotion in the direction of professionalism, aiming at the targeted markets, with tourism products and brands as the focus, in addition to attaching tourism promotion with the dissemination of the nation’s images", is one of the key solutions highlighted in the Vietnam Tourism Development Strategy to 2020, with a vision to 2030. The task requires a strategic and systematic approach and action, with the involvement of departments from the central to the local level.